HoHoHo!! Santa Claus is coming to town!! Hey friends, Have you sing a birthday song to Jesus??! !Haha, or are you rocking the jingle bell?? a celebration in my honor and I think that this year the celebration will be repeated. is talking that my birthday is getting closer and closer. It is really very nice to know, that at least once a year, some people think of me. As you know, the celebration of my birthday began many years ago. them, but in these times, no one seems to know the reason for the celebration. the meaning of the celebration. I remember that last year there was a great feast in my honor. But, do you want to know something? I wasn't invited. I was the guest of honor and they didn't remember to send me an invitation. with them and share their table. their doors to me. Since I wasn't invited, I decided to enter the party without making any noise. I went in and stood in a corner. laughing at everything. They were having a grand time. if the party were in his honor! waiting for someone to hug me and do you know no-one hugged me. shared gifts and you did not get one? I then understood that I was unwanted at that party and quietly left. eat and drink, and nobody remembers me. 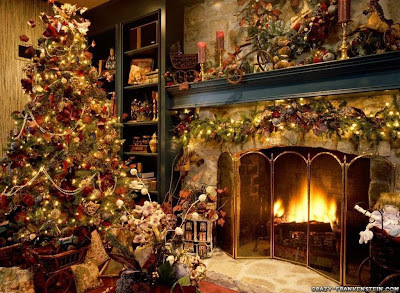 I would like this Christmas that you allow me to enter into your life. Today, I only want that you believe this with all your heart. I will have my own celebration, a grandiose party that no one has ever imagined, a spectacular party. I'm still making the final arrangements. Today I am sending out many invitations and there is an invitation for you. and write your name with golden letters in my great guest book. Only those on the guest list will be invited to the party. when all is ready you will be part of my great party. See you soon. I Love you! Share this message, before Christmas. Get the monkeys off your back. 1. Break the problem or decision into smaller pieces. 2. Gather the information you need. 3. Move off dead centre to get a different perspective. 4. Try God — God’s always there! 5. Let go and learn. 6. Don’t dwell in the past. If decision-making is a difficult task for you at this point in your life, put a message like “You’re a Good Person! You can Make Good Decisions!” somewhere that you’ll see every day. Read it! Believe it! Trust yourself and go forward. Satan called a worldwide convention. In his opening address to his evil angels, he said, "We can't keep the Christians from going to church. We can't keep then from reading their Bibles & knowing the truth. We can't even keep them from conservative values. But we can do something else. We can keep them from forming an intimate, abiding experience in Christ. If they gain that connection with Jesus, our power over them is broken. So let them go to church, let them have their conservative lifestyles, but steal their time, so they can't gain that experience in Jesus Christ. This is what I want you to do, angels. Distract them from gaining hold of their Savior & maintaining that vital connection throughout their day." "How shall we do this? ", shouted his angels. "Keep them busy in the non-essentials of life & invent unnumbered schemes to occupy their minds," he answered. "Tempt them to spend, spend, spend, then, borrow, borrow, borrow. Convince the wives to go to work & the husbands to work 6 or 7 days a week,10-12 hrs. a day, so they can afford their lifestyles. Keep them from spending time with their children. As their family fragments, soon, their homes will offer no escape from the pressures of work." "Overstimulate their minds so that they cannot hear that still small voice. Entice them to play the radio or cassette player whenever they drive, to keep the TV, the VCR, & their CD's going constantly in their homes. And see to it that every store & restaurant in the world plays music constantly. This will jam their minds & break that union with Christ." "Fill their coffee tables with magazines & newspapers. Pound their minds with the news 24 hrs. a day. Invade their driving moments with billboards. Flood their mailboxes with junk mail, sweepstakes, mail order catalogues, & every kind of newsletter & promotional offering, free products, services, & false hopes." "Even in their recreation, let them be excessive. Have them return from their recreation exhausted, disquieted & unprepared for the coming week. Don't let them go out in nature. Send them to amusement parks, sporting events, concerts & movies instead. And when they meet for spiritual fellowship, involve them in gossip & small talk so that they leave with troubled consciences & unsettled emotion." "Let them be involved in soul-winning. But crowd their lives with so many good causes they have no time to seek power from Christ. Soon they will be working in their own strength, sacrificing their health & family unity for the good of the cause." It was quite a convention in the end. And the evil angels went eagerly to their assignments causing Christians everywhere to get busy, busy, busy & rush here & there. Has the devil been successful at his scheme? You be the judge. Hooray!!! The campus mass was great. God - for guiding us to organise this event successfully. Everything in him was perfect. this Holy Eucharist mass for us and once again, we fell in love through his blessed and chosen hands. Greg- from ASAYO, he helped us to set up the mass. very happy to see that they were there to share the love of God! Committee members - They really worked hard for God!! Aligato! The in1vited "lecturer" was giving a talk. He said:" BIBLE- Basic Information Before Leaving Earth! We should read the bible, pray using the bible and through bible, we can understand what's God wants us to do. There are two important things in the mass.Firstly, the first and and second reading as well as the gospel. Then, the Words of God become the flesh which will be with us always!With this, he encouraged CSS to have bible discussion with the members. " Everyone was paying attention during the mass. Last but not least, with this mass, we get the strength to face our final exams which are just around the corner as well as our college life!! God bless. Hey,friends!! If can, please wear pink during the mass. Hehe,this month is also called the Pink October- a month to increase our awareness towards breast cancer. Shalom to all my friends! 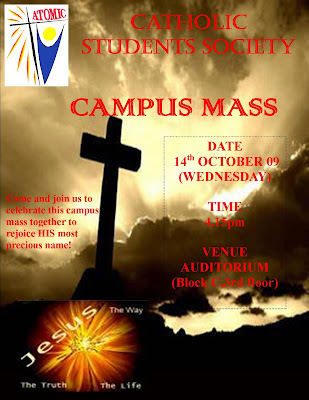 The UCSI Campus Mass is coming!! Please be sure that you will be free on that time for the mass, opps!! it should be for the God. This is a gift for us once again to experience God and be closer to him. So please make sure that you are free on that day for this wonderful event. Place: Auditorium, Block C, South Wing,UCSI University. We sincerely invite all of you to come for this mass and it will be great to give praise and worship to God together. Here's a true story which I heard from a visiting priest from Canada (Fr. Carl Schmidt) a year ago. This is a story told to him by Cardinal Jaime Sin of the Philippines ( which I like to use in my talks ). The story: There was this woman who claimed to have visions of the Virgin Mary and she claims that she even talks to the Virgin. Cardinal Sin (his real name) didn't pay much attention to her and usually pretends not to hear her. But one day she persistently kept on calling him on the phone, and after five unsuccessful calls, she went to his residence and asked for an audience.Cardinal Sin thought that he'd better put an end to this foolishness and told her, "When you see the Virgin Mary again tonight, tell her to ask her son Jesus what my gravest sin was." And so the woman left, happy that finally Cardinal Sin believes her. And Cardinal Sin was sure that now she'd stop telling him about her visions. But the next day she came back and asked to see the Cardinal again. The Cardinal asked her, "Well, did you talk to the Virgin Mary last night? "And she said, "Yes, but...""But what?" Cardinal Sin asked. "Did the Lady ask Jesus about my sin? ""Yes, she did ask Him." was the reply. "What did Jesus tell her then? 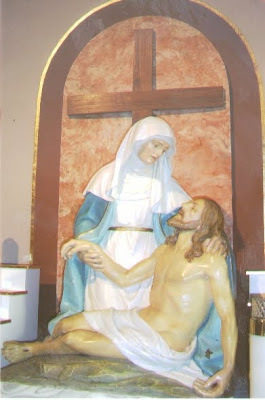 "The woman reluctantly answered, "She said Jesus said that He had forgotten." I don't recall how the story ended, but I guess that is where the story should end. Reflection: "And now i said to you: You are Peter and on this rock i will build my Church; and never will the powers of death overcome it. I will give you the key of the kingdom of heaven: whatever you bind on earth shall be bound in heaver, and what you unbind on earth shall be unbound in heaven" Matthew 16:19-20. This shows the importance of forgiveness to have an intimate relationship with God. When the good Lord was creating mothers, He was into His sixth day of overtime, when an angel appeared and said, "You're doing a lot of fiddling around on this one." broken leg to a disappointed love affair; and six pair of hands." The angel shook her head slowly and said, "Six pairs of hands...no way." "It's not the hands that are causing me problems," said the Lord. "It's the three pairs of eyes that mothers have to have." "That's on the standard model?" asked the angel. The Lord nodded and said, "One pair that sees through closed doors when she asks, 'What are you kids doing in there?' when she already knows. Another here, in the back of her head that sees what she shouldn't, but what she has to know, and of course the ones here in front that can look at a child when he goofs up and say, 'I understand and I love you,' without so much as uttering a word." "Lord," said the angel, touching His sleeve gently, "Rest for now. Tomorrow..."
"I can't," said the Lord. "I'm so close to creating something close to Myself. Already I have one who heals herself when she is sick, can feed a family of six on one pound of hamburger and can get a nine year old to stand under a shower." The angel circled the model of the mother very slowly. "She's too soft," the angel said. "But tough!" said the Lord excitedly. 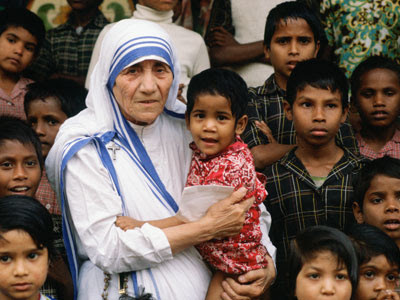 "You cannot imagine what the mother can do or endure." "Not only think, but she can reason and compromise," said the Creator. Finally the angel bent over and ran her finger across the cheek. "There's a leak," she pronounced. "It's not a leak," said the Lord. "It's a tear." The Lord God said, "It's for joy, sadness, disappointment, pain, loneliness and pride." "You're a genius," said the angel. The Lord looked somber and answered, "I didn't put it there." Hey guys!! It's Clare reporting from the news division!! 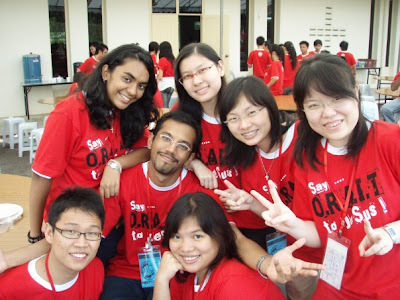 Haha.. Nah... Ok, I'm actually updating to you guys about what had happen in ICG camp 2009 though... There are 3 of us from UCSI, me, Byron and Greg... O yeah! Our ex-CSS members are also there!! Rebecca and Ivan!! The theme for the 4-days 3-nights camp is "Our Religion As an "In-Thing" better known as "O.R.A.I.T." 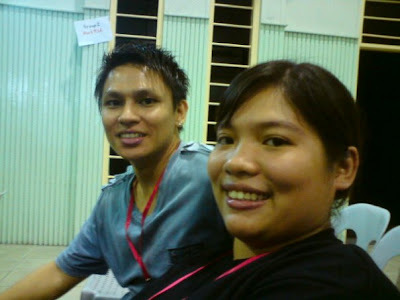 and was held on the 19th to 22nd September 2009 @ Majodi Centre, Plentong, Johore. 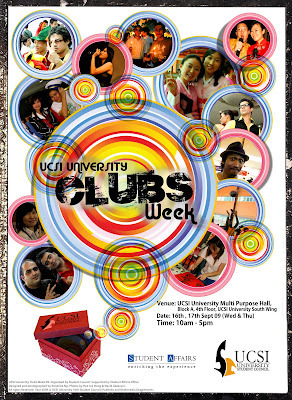 There are more than 500 students come and gather for this every 2 year event. Of course the largest population is from our CC itself, KLCC!!! And the largest CSS population hails from CSS UiTM Shah Alam... There are talks, group discussions, movie making, performance, dialog and so on! One of the highlights of the event is Project Runway where the participants have their nice and cool outfit on and walk like a model... There are also speakers come from Malaysia and also Singapore, from movie producers to researcher... We also have Juwita Suwito in the HOUSE!! Well, to sum up everything, it's actually fun though... And I did not regret joining ICG camp... And it comes from the bottom of my heart.. Anyway,the next ICG camp will be held in 2011 though... And KLCC will be the next host for this event!! Yeay! Continue from the previous post.. 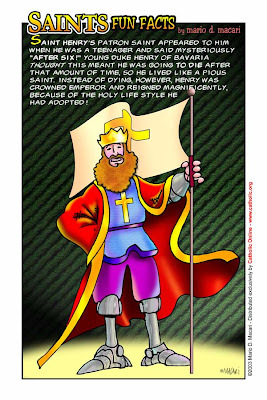 Reflection: There are a lot of challenges a priest faced today....do we ever underestimate their respolnsibility?or we espect them to be extraordinary "holy" but we didnt pary for them? Please pray for Brother Simon who involved in an accident at 2am on 28th August.And he is in critical condition at the Penang Hospital. Bro Simon has asked for our prayers that his brother will survive the treatment in the hospital and also that he will be back to normal. As a christian, we must know how to pray as this is the treasure that God gives us. So don't forget to make a call to Jesus to ask for his healing on Brother Simon and his brother as well aas his family. As it is the Year of Priests, does it mean that it has nothing to do with those normal parishioners? Do we have any parts to play since this is not 'our' year or 'our family' year? And as the priests are so close to God and they are always regconised as the great prayers,do we need to pray for them? Of course,we need as they need our prayers too. They need us to pray for them so that they are able to face all the challenges, suffering, sorows and so on when doing the works of God. So how are we going to pray for them? Don't worry, when there is a will,there is a way. 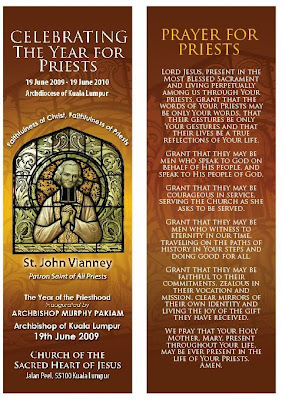 We can pray through St John Vianney's prayer and this "fastprayer" only takes your 1 minutes!! How great is St. John Vianney? Erm...I did some reading on his story and it touched a lot. With his simple outlook, he has done great things and he has an outstanding faith towards God. Okay, lets have a brief on his life. I'm sure you will be stunted with his uniqueness. Jean Marie Baptiste Vianney was a religious personality of unusual force. To the incomparable exclusion of everything else he addressed himself to the greater honor and glory of God and the salvation of souls. He accepted his obligation to holiness at an early age, and it took complete possession of him. Every word he uttered was spoken out of the world of religiousness. He brought to a conclusion an achievement which it would be hard for anyone to imitate. From this man there emanated an influence which cannot be overlooked, and the results of which cannot be contested. It was only after much toil and trouble that St. John Vianney was admitted to the priesthood. At the age of 20, he was having great difficulty in his studies for the priesthood. Mathias Loras, perhaps the most intelligent of Jean-Marie’s fellow seminarians, who was assigned to help him in his lessons, was of a nervous and excitable temperament. One day his patience was exhausted by the sheer incapacity of the big young man, and he boxed his ears before all the others. Jean-Marie was also excitable, but he knelt down before the boy of twelve who had treated him so outrageously and humbly asked his forgiveness. Mathias had a golden heart. Suddenly he felt smitten with grief and, his face bathed in tears, he threw himself into the arms of Jean-Marie who was still on his knees. This incident marked the beginning of an abiding friendship. Mathias Loras subsequently became a missionary in the United States, and eventually Bishop of Dubuque, but never could he forget the action of Jean-Marie and the accent with which he spoke on that occasion. Reflection: How many times do we seek for forgiveness from the others? Do we able humbling ourselves to ask to be forgiven although we are still "hot"? Let be an active disciple of God!! Event: Grace Youth Conference 2009 "IDENTITY"
""Before I formed you in the womb I knew you, before you were born I set you apart; I appointed you as prophets to the nations" (Jeremiah 1:5)"
Greetings everyone, We have arrived to the end of the semester again. 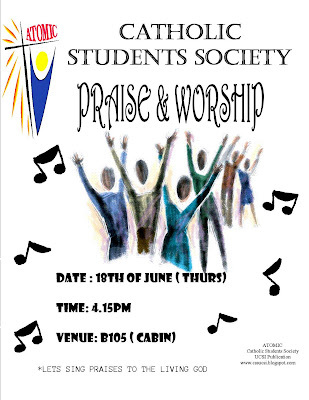 This Thursday would be our last activity for the semester.Hope you guys can join us. 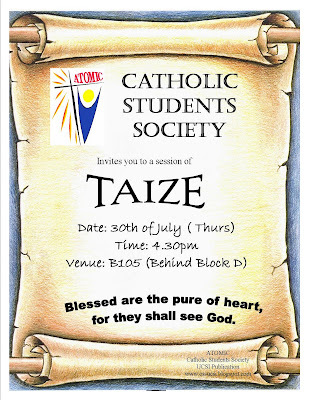 PLease join us and try to bring your friends along.GOOD LUCK FOR YOUR FINALS God bless u. Setting up the party together. Chit-chatting while decorating the party!! We are in white....two angels?? Power Point Presenter of the day. Wow...Nice cake with full of chocolate and M&M.Thanks Keshia! Event began. Joy and Joanne were the emcees!! President Brigitte was giving her speech.. Waiting for the instructor to give new instruction...fast!!! Kawaii!!! Happy Birthday to all of us!! 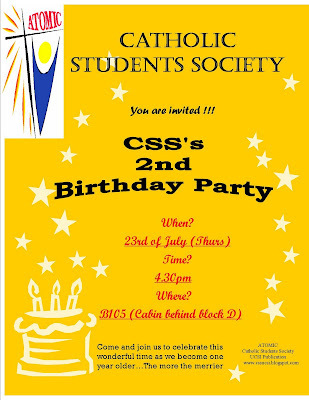 Hey, Happy Birthday to CSS again!!!! We are going to celebrate this important event this week so please take note of the date of celebration through your email or cssucsi blog. Join our party as our appreciation to His care. Hehe........If can, bring snacks, food or drinks there so that we can share them together!! Waiting to see all of you there. The former president of South Korea, Roh Moo-Hyun committed suicide at 29th May 2009. This was a shock news for the Korean and even the world as he was a very famous people. His supporters in North Korean started to have demonstrations to shows their sadness of losing a beloved president and angriness to the current president. With this we can view the difference between Judas and St. Peter. Jesus asked St. Peter three times, “do you love me?” St. Peter always replied, “Yes, you know I do” And Jesus gave the key of Heaven to St. Peter. Although St. Peter did refused that he knew Jesus for three times and he felt regret so much, he still has high confidence in Jesus. Whereas Judas lost all his confidence in God after Jesus died, he lost his trust that the Jesus as savior of mankind who came down for us, the sinners. Besides that, amazingly, although Jesus had been tortured during the way of Cross, being spurt by the saliva, teased and crucified because of the jealousy of the priests during that time, he did not have the intention to take the revenge back on them when he resurrected. Instead, his first word to the apostles was “peace be with you”. He himself has shown the commandment that he has given to us, Love your neighbor. Brothers and Sisters, the greatest love is no longer “love people as how you love yourself” but it is “love the people as how you sacrifice yourself for them. (In the evening of that same day, the first day of the week, the doors were closed in the room where the disciples were, for fear of the Jews. Jesus came and stood among them. He said to them, 'Peace be with you,' John 20:19) Amen. Last but not least, committing suicide is not an act of courageous but those who willing to face the diseases and are preparing to face the imperfect due to the disease, the suffering of the pain from the disease without losing their faith are. Bravo!!!! May God bless them always and peace be with them as well as their family. We began as a small group early in 2007, gathering in a friend's condo unit. There were about 8 -10 of us only. This motion of creating our own catholic student society was mooted by Ms. June and Ms. Rose, two biotech students. A few gatherings were held until it mellowed down due to exams and holidays. In April, Ms. June requested Mr. Gregory to continue the gatherings due to her health problem and he pushed for the formation of a CSS in UCSI. In the month of June, he, together with some members met Ms. Jennifer from Campus Ministry Office to discuss about the formation and the motion was set to officially form CSS. 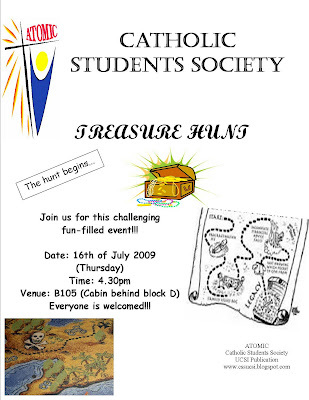 We had our inaugural gathering with an AGM on the 6th of July 2007 with a good turn out of 40 students. 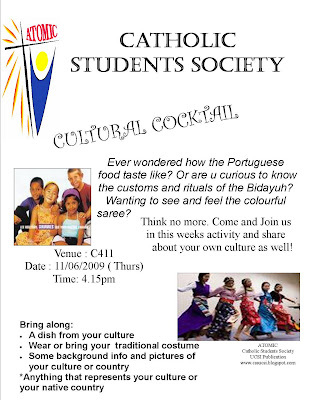 CSS-UCSI was born and here we are doing God's work.